About Us - Scale and Control Inc. 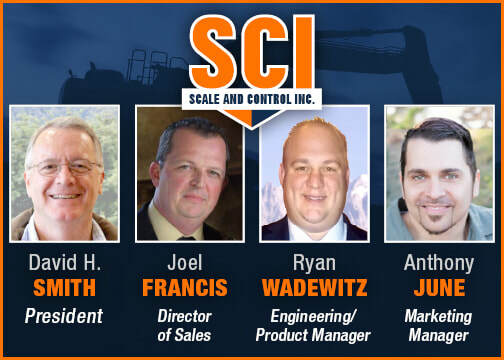 Scale and Control Inc. provides industrial product solutions that enhance productivity, equipment utilization and increase operator/driver site awareness. In addition, we provide branded promo and apparel solutions to increase your brand awareness amongst your customers through our SCI Promo and Apparel division. Weighing Systems - Onboard Weighing System for Wheel Loaders, Skidsteers, Front End Loaders, Forklifts, and more; Designed and manufactured by Scale and Control Inc.
Joel has over 20 years experience in customer service and relations as well as over 10 years of sales, service and international operations management in the crane and lifting industry. Also a decorated combat veteran, Joel proudly served 10 years in the U.S. Marine Corps. Anthony has over 20 years experience in digital and print graphic design, marketing, branding, and fine arts. His work is featured across several industries including oil & gas, technology, healthcare, education, nonprofit, and others. Anthony attended the University of Texas at Austin, graduating with a BFA in Design and a BA in Studio Art, specialty in Motion Graphics. In addition to being a designer, he has professional experience as an Educator and a Musician. David has over 30 years of sales, marketing, operations, and management experience, along with 30 years experience providing solutions to the construction industry (crane instrumentation, heavy equipment attachments). He also has 5 years of experience within the transportation industry (on board computers) and over 10 years enjoying the RV world travelling the country with 5th Wheels and Class A buses. Contact us today to learn more about our wide variety of product solutions!